To view all upcoming workshops, please click here. Four Steward Learning Series Modules – Local 5430 (Region 3) only. Please see special instruction for registration. • Communicate effectively with members. 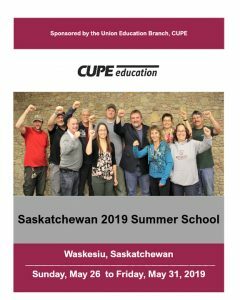 Treasurers will learn how to use the CUPE electronic ledger, manage the local union’s funds and accounts, and prepare reports to the membership and the trustees. Trustees will learn how to properly perform an audit of the local union’s books, accounts, properties, and assets. At the end of this workshop, Trustees will be able to make recommendations to the local union to improve the local union’s financial health. • dealing with workplace complaints.NOTE: See more Stewarding courses under the Steward Learning Series.